TL Clark is a British author exploring different kinds of love. This book, set in the wild woods of Wales, was inspired by her knowledge of witchcraft/paganism and her love of vampire books. Shakira has never quite felt accepted, or that she fits in anywhere. She grew up never quite getting too close to anyone, and her tall and lanky stature certainly didn’t help matters. This feeling of not belonging drives Shakira to find somewhere she does belong, and so she packs up and leaves home to find her place in the world. This leads her to a small village, though all is not as it seems. Shakira will learn things she never knew and her life will change in a thrilling way with a twist at every turn. Will she be able to find the place where she belongs? Or will she be forever searching? 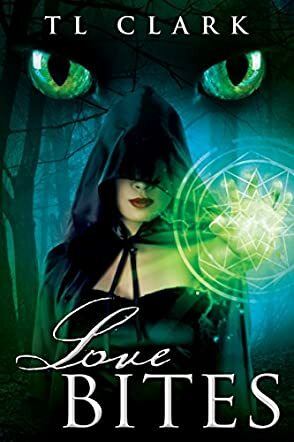 Follow Shakira throughout her journey in Love Bites: Darkness & Light Duology Book 1 by TL Clark. When I was searching for a romance-themed book with a fantasy type twist, this book hit just the spot. There are books that you can just idly read through and those that demand to be read in one sitting and, if you do manage to put them down, they haunt your thoughts until you pick them back up. This is one of those books. TL Clark is a mastermind with this story, drawing you in with a relatable character and then keeping you hooked with an intense story that has plot twists at just the right times. The characters are very well rounded and develop beautifully along with the story’s plot. It is just perfect for those searching for a good story with a bit of romance. I highly recommend Love Bites, considering I just finished the first book of the duo and I have already purchased the second one to read once I finish this review! Loved this book. Fantasy, escapism, romance and a jolly good yarn.